As far as old movies or old pictures can be restored, it is possible to restore sound recording, to filter parasite noise, to amplify or to diminish the volume, to give it a concert hall or a cathedral resonance, to add echoes to a voice as if it would answer itself. The orchestral instruments surround can also be modified if we have the tracks corresponding to each instrument. Acoustic space is therefore to be modified; spatialization of each instrumental component of a melody is rebuilt with a computer. Percept-studio creates a new acoustic space and gives back to sound the space where it lives, the space where the sound finds its own breath. 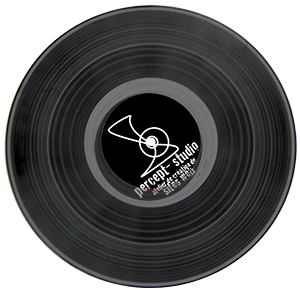 Percept-studio has given to Mister Michael Marié’s song, introducing the website created for him, a spatial texture lacking from its original recording. In the flash version of this article, to this resonant sound, amplified and purified from any parasites noise, percept-studio has added all the little scratches and dusty clicks making old vinyl’s charm. May the nostalgic be glad with these ancient tones, they shall find there a bit of the grace an antique vinyl might have!